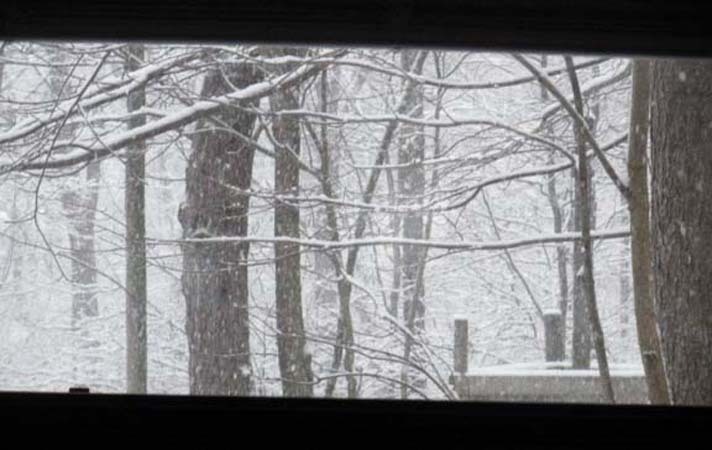 WaterSong Woods Cabins are in secluded areas on 75-acres of woodland in Hocking County, about seven miles north of Logan, in the southeastern part of Ohio. Visitors have convenient access to the Hocking Hills State Park which includes Ash Cave and Old Man's Cave, the Wayne National Forest, and many other scenic areas. Harmony and Melody both have spacious hot tubs on roofed decks that overlook scenic woodlands. Trails let you wander over our 75 acres of hills and valleys. 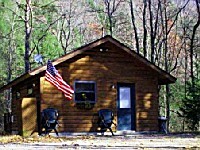 The cabins, though secluded, are conveniently near the Hocking Hills State Parks which include six parks with hiking and horseback trails. Melody Cabin is wheelchair accessible.Each cabin sleeps three and features a spacious hot tub, kitchen facilities, satellite TV/VCRs, telephone and CD player. wheelchair access to the deck. Harmony offers a futon and a relaxing way to both lounge and sleep. It serves as both a couch and bed. A chair futon serves as a single bed. The fully-functional kitchen includes a complete service for four, cook ware and coffee maker. Accommodations on the deck include lawn furniture and charcoal grills. Handicapped accessible. Wide doorways, accessible bathroom/shower stall, level drive. Hot tub on roofed deck,very private queen bed kitchen/cookware, dinnerware electric grill satellite TV/VCR, CD electric heat/AC telephone. 75 acres scenic trails.